LA Auto Show: New Fuel Tech | OhGizmo! The Honda FCX Clarity may have been the star of the LA Auto Show when it came to new fuel innovation that anyone normal (i.e. not a millionaire) has the potential to get their hands on in the near future, but that doesn’t mean that everyone else has given up on the idea. Quite the contrary, in fact. After the jump, read about the Chevy Volt, concepts by Volvo, Toyota, and BMW, a custom Ford hydrogen/biodiesel monster, and of course the Tesla Roadster. Of course, one of the most highly anticipated hybrid electric production concepts is the Chevy Volt, and it’s easy to see why. It just looks like the future. And it acts like it too, combining plug-in rechargeable batteries (25 mile range) with a small, modular engine to recharge the batteries on the fly, for a total range of over 600 miles. Some people (Tesla, most notably) have criticized the inclusion of an engine as forestalling the development of a purely electric car. But what’s your Tesla Roadster going to do when you’re low on juice and have someplace you want to go? The Chevy Volt should be on the market in 2010 for $20-$30k, with an initial production run of >50,000 cars. 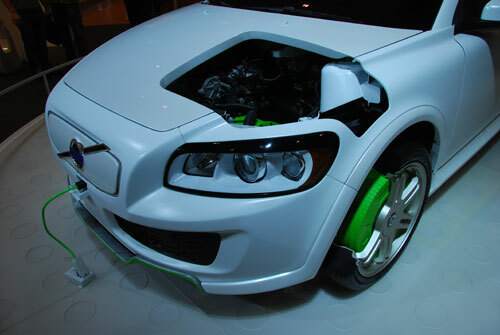 The Volvo ReCharge is a Flexifuel/battery powered car based on the C30 platform. Like the Volt, the 1.6 liter engine is only used to recharge the lithium battery packs (located in the trunk) when necessary. The batteries will power the car for 100 km after a 3 hour full charge, and should have a useful lifetime longer than the car itself. 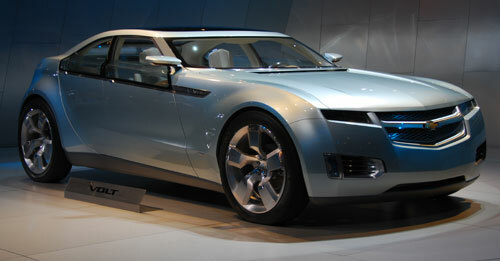 Something like this may be available around 2015, but Volvo will be releasing a hybrid before then. 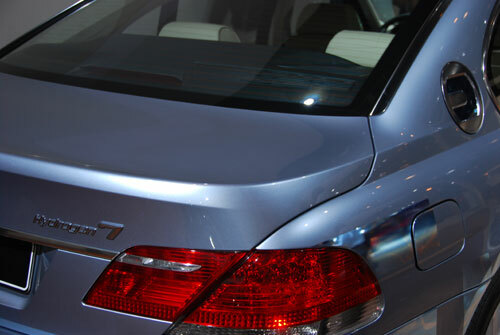 The BMW Hydrogen 7 is a production-ready version of the BMW 7 Series that has been modified to run on either hydrogen or gasoline. You literally just have to push a button on the dashboard to switch between the two, which gives the car a unique and valuable versatility when it comes to hydrogen fuel and the primitive state of the current distribution system. All that convenience comes at a cost, though: the hydrogen tank is the size of a washing machine (it’s in the trunk), and the hydrogen itself is stored as a liquid, at -418 degrees F. Just keeping it that cold uses a third of the energy in the tank. As the hydrogen warms and evaporates, it’s vented, so you lose about half a tank of it after 9 days. Plus, a full 45 gallon tank only gets you 125 miles on hydrogen alone. Mixing in gasoline bumps that up to a respectable 400+ miles. You may see a Hydrogen 7 around sometime next year, but only for testing. No word on commercial availability. 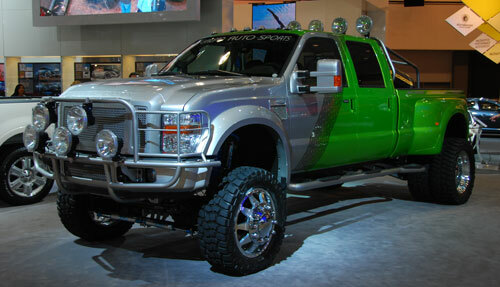 This is a heavily, heavily modified Ford F-450 Super Duty. All of the exterior and interior work was done by Galpin Auto Sports (from MTV’s Pimp My Ride), but the drivetrain was created by SAE Energy. 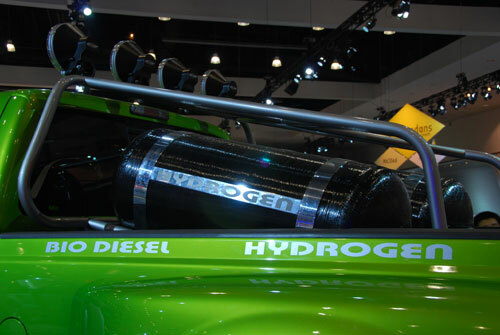 There wasn’t much info at the show, but I contacted SAE, and here’s what they had to say: “It is a dual fuel biodiesel hydrogen system that uses an ecu to provide biodiesel dual fuel operation with hydrogen substitution. We are able to derate the biodiesel as the hydrogen increases and provide a true fuel substitution. We have many safety systems built in the system which we have designed also. I drove the vehicle about five weeks ago and with the hydrogen dual fuel the vehicle runs so smooth you could almost not tell the engine was operating. I did not want to turn it off.” Nutshell? It uses hydrogen AND biodiesel at the same time, and can spit out 500hp and 800 torques. Oh, and Galpin fitted it out with a 1600 watt sound system. And 4 iPhones. Not bad. 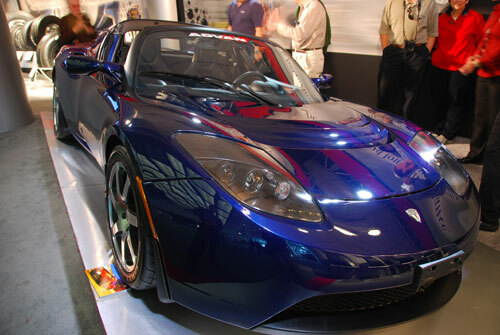 Last, but by no means least, is the totally electric, totally badass, Tesla Roadster. Its design is based on the Lotus Elise, but the guts are pure Tesla. The roadster can go from 0-60 in 4 seconds thanks to the flat electric torque curve, has a top speed of over 130mph, and an impressive range of 245 miles on a single 3.5 hour charge of its lithium ion batteries. According to Tesla, the roadster is still on schedule for delivery (first quarter 2008ish), and there are no significant technological hurdles remaining. I did ask the rep what the expected useful lifetime of the battery pack was, and what sort of “memory effect” decrease in efficiency could be expected over time. He said Tesla has been researching that extensively, but isn’t yet ready to make the results public. Hmm, let’s hope that doesn’t mean it’s bad news. Either way, replacing the car’s battery pack should run you about $20k. The car itself will run you just barely under $100k, if you can find one. Hi! Very interenting web site! Congratulations! I’m waiting to see these models produced, in the near future, and I hope more and more people would start to use them. Among all these cars, the Ford F-450 got my attention. Though it may not look as classy as the others but looks really tough and can endure such heavy duty tasks.